Yesterday I spent a good part of the day reading the Slovak law about visa requirements and searching for websites that could possibly help explain the process of applying for a visa. Today I went to the Bannockburn police department to get a fingerprint card to submit to the FBI to get an FBI Identification Report (my RAP sheet) which I will then need to translate and send in for official translation verification, which I will then need to submit for an apostille, which I will then submit with my Visa application along with about four other documents that have to go through a similar process. People often think of the tower of Babel as the beginning of language divesity. True. But people don’t often think about the fact that you don’t have to take a huge leap of logic to get from languages to visas. Instead you can take a series of small leaps from languages to cultures to nations to borders to visas. And that pretty much sums up missionary pressure points. It wouldn’t be so bad if they didn’t make it so Kafkaesque. You can never be quite sure just exactly what to expect when you start the visa process. It seems like every five years or so they pass a new law relating to visa requirements and every single year they have a new form or new office or new interpretation of the law that changes the process. During the whole process you feel like a suspect on trial until finally you get that golden stamp in your passport that gives you, not a clean bill of health, but a grant of appeal. Until next year. You need a visa? Don’t you have a green card for Slovakia? (I have one for Czech Republic). 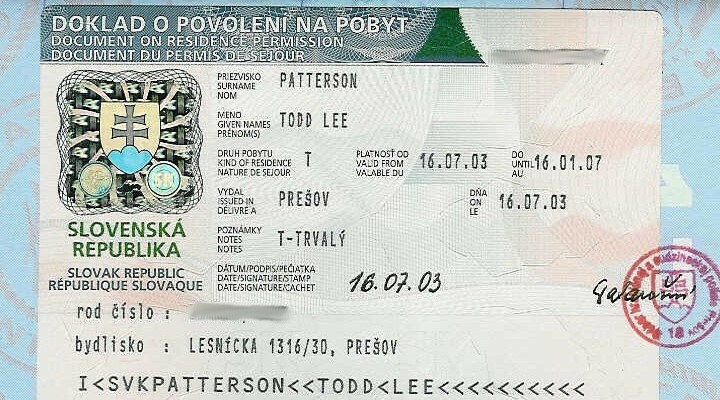 In Slovakia they call it a national visa for permanent residence. It’s like a green card, I suppose. But I think (I’m not sure) I have to submit a request for a first permit because I basically gave up my permanent residence when we left in 2005. A great video clip! Captures the moments of torment very well. May your gold seal arrive in your passport with a smile. Grace to you as you proceed.